After 5 days of working straight for ten hours and a lot of follow up work including stain, multiple coats of varnish, and paint we are finally finished. I think it turned out wonderful and couldn’t be happier about the results. It was a great learning experience and not all that complicated as long as you have patience and some good do-it-yourself experience. The pride of building something like this yourself and saving thousands on highly skilled labor is enough to make me want to do it again someday. Before we had a huge dividing wall separating the downstairs living space from the staircase. 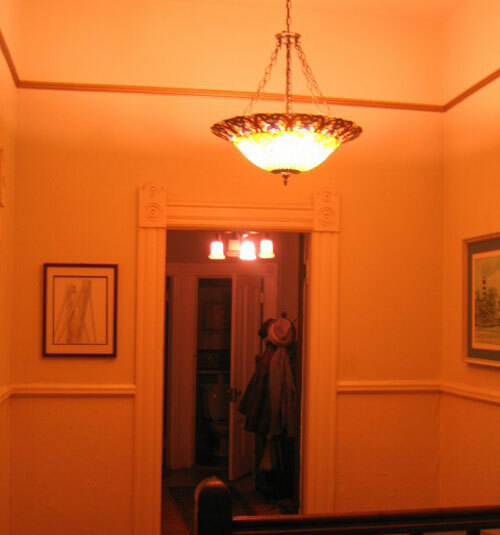 This made the entry feel small and blocked the light from traveling further back into the first story of the house. 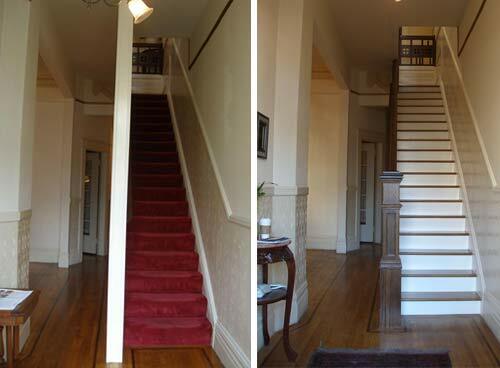 Now we have this grand Victorian entrance with a matching banister throughout the house that hopefully pays homage to what this place looked like 119 years ago. 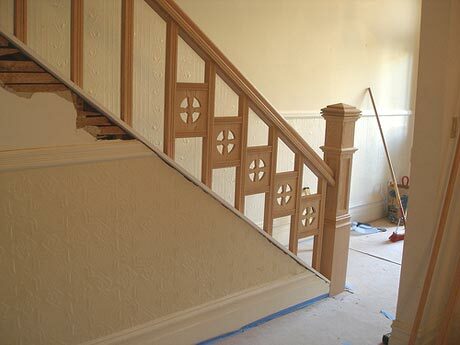 All of the pictures can be found on the Victorian Staircase Restoration Flickr Set. As day five and the final day of the project comes to a close we have completed the build. All the moldings and trim are in. All the holes are filled. The entire staircase is sanded and its ready to be stained and painted. Its been a long five days, working about 10 to 12 hours each day. There’s still more ahead but it feels good to get the bulk completed. 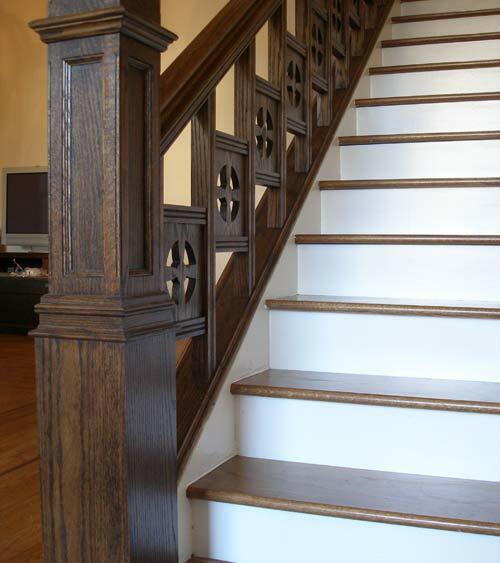 I’d like to thank my dad for helping me to build my first staircase, Scott Bowles from SF Victoriana for recreating all of these components for us, and the Wood Works Company for creating our beautiful newel post. Without these folks the project would not have come together as well or as quickly as it did. I’m off on vacation now but when I return I will stain and finalize the project, being sure to post pictures along the way. I have posted a few new pictures on my Flickr page as well for your enjoyment. As day four comes to a close the staircase is complete. There is still a ton of finish work to do including setting nails, adding filler, finishing plaster, and course the final stain, but the staircase is done. All the new treads and risers are in, the railing and balusters are done, and all the final crosses are here. Besides my dad of course, I’d especially like to thank Scott Bowles at SF Victoriana for coming through in the last hour with the final pieces we needed. I promise to update more as we progress on the finish work but now its time to get some rest. For now, you can find more pictures on my flickr page. On day two of the build my father and I have made a great deal of progress. On day one we we finished clearing the debris and preparing the stringer, which holds the treads in place, for a piece of molding that all the balusters will be attached to. 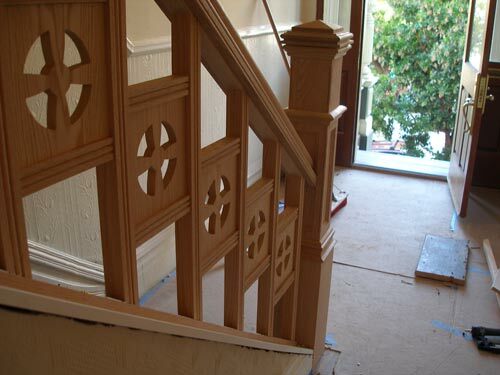 We also got the newel post in place which proved a little bit tricky. Unfortunately the newel was not hollow like most box newels are. This one was completely solid, probably why it weighs 86 pounds. Luckily for us we have access underneath the floor via the garage so we could drive four lag bolts up through it. On the beginning of day two we got the railing in place after fitting it multiple times. The old adage, “measure twice cut once” really comes into play here. The are some complicated angles involved, especially when the house is not perfectly square as it is 119 years old. Making a mistake on a 16 foot long railing that costs $300 dollars and weeks to make could set us back a lot of time. So now, I must go back to work and stop writing blog posts on the Internet. There will be another update shortly, hopefully tonight. 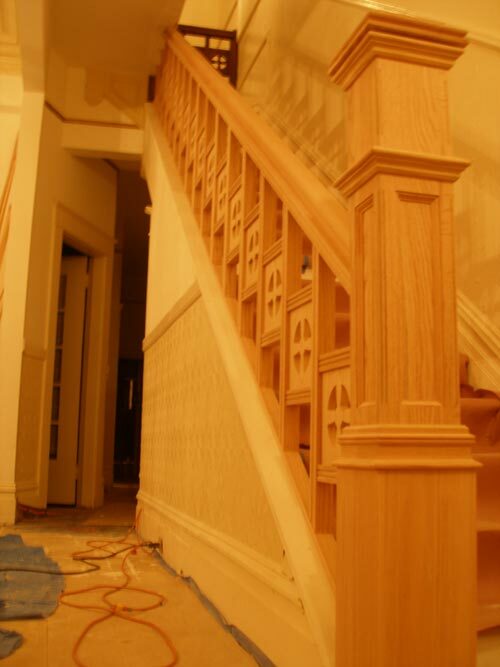 Now its time to put in all the balusters. For more pictures please visit my Flickr page. As I mentioned back in the post Rebuilding A Long Forgotten Staircase back in June, we’ve been gearing up to take down this old dividing wall and put a banister. Well this weekend my housemate and I got down to it. It only took us a few hours to seal off all the rooms, lay down cardboard and tarp, and knock down all the lathe and plaster. Tomorrow we will cut down all the studs and clean up to prepare for the banister that is going up. My dad who is an expert woodworker is coming into town this Monday to help me build this thing, or should I say, teach me how to build it. I will attempt to write a post every other day this week as the build progresses. Stay tuned here or on my Flickr page. 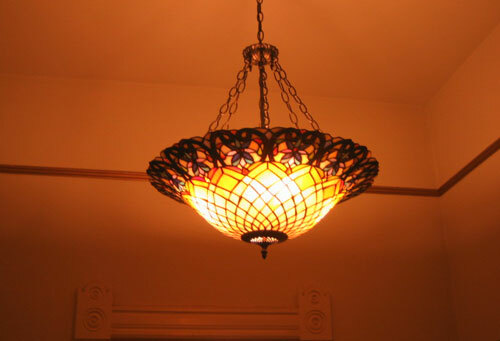 Pictured above is our upstairs banister. This is original to the house just as it was for my four other neighbors. Our guess is that the architect of our houses was also building a church at the time judging by the crosses but we really just dont know. 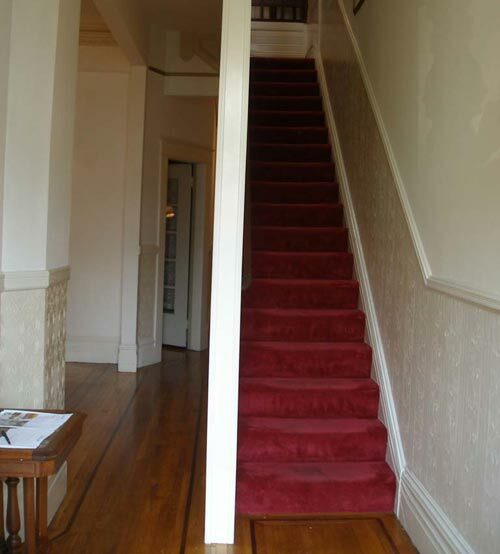 Although the banister you see above is in a good shape the lower banister had been removed decades ago. Since the house was split into two units at one point in its life a wall was put up between the upstairs and downstairs. 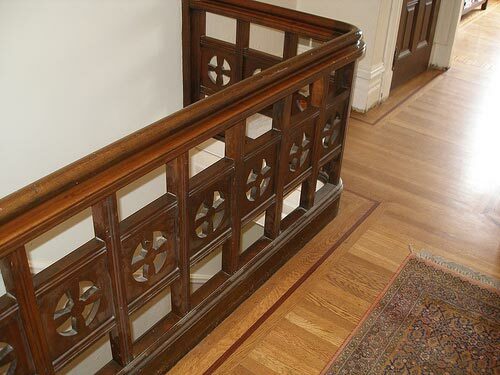 We were hoping that inside the wall we would find ourselves a banister like our neighbors did but no such luck. Obviously whoever did the work on our house didnt have the foresight that the neighbors did. Anyway, we were only left with one choice; rebuild it ourselves. Below is a picture of the dividing wall that we are going to be knocking out. We enlisted the help of SF Victoriana to recreate the components off of what we already have. They have special knife setups to recreate any profile imaginable for railings, moldings, you name it. 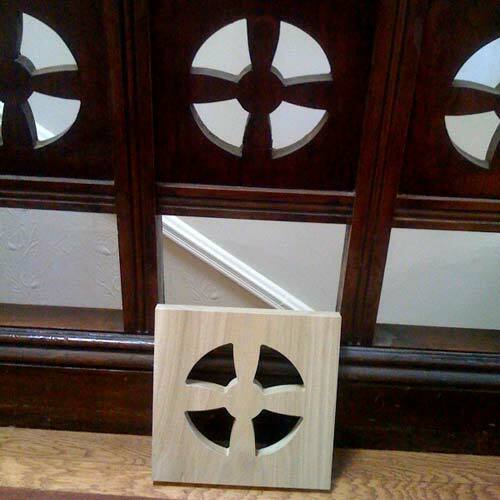 Pictured below is one of the 15 crosses they are making for us. We will have more info to come as the project progresses. Right now we are in the gather and plan phase. 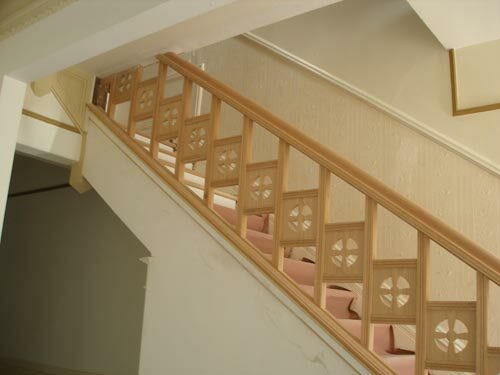 Also, for more pictures of the staircase check them out on flickr.